As promised, I end my birthday with a bang with the second of two reviews, and what better way to celebrate a birthday than with a party... game! Like Hue before it, we have another game with a color-switching mechanic. However, this one is totally involuntarily and, as stated, is a party game as well as a platformer. It's Runbow, but not the digital version-- no, the retail release from this past November, Runbow: Deluxe Edition! 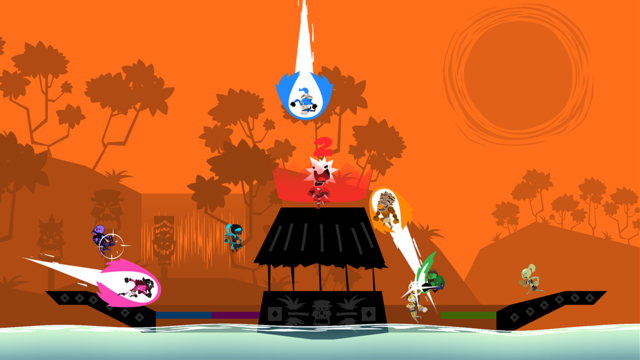 Runbow, party of up to nine? Your fun is waiting. 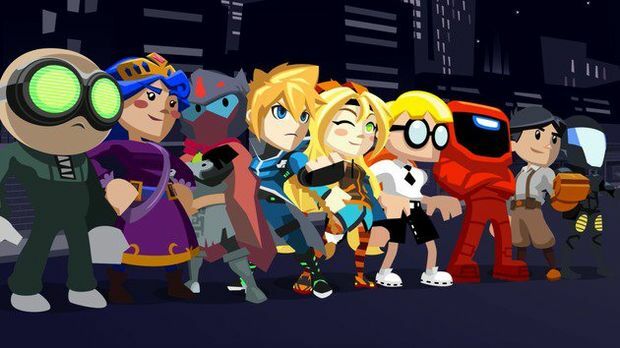 13AM Games was a brand-new indie studio when they released Runbow back in 2015 on the Wii U. It saw moderate success, so much so that a year later the game received a special retail release. That physical version of the game is Runbow: Deluxe Edition, and it's all the fun of the Runbow experience without taking up room on your Wii U hard drive! 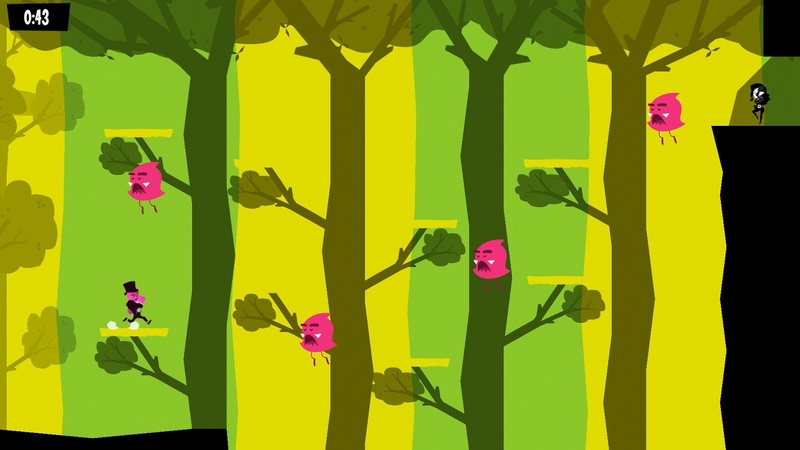 Runbow at its core is a fast and frenetic 2D platformer that feels great to play. What separates it from other indie darlings of the platforming variety is the game's constant color switching mechanic, where the background routinely shifts between different colors. When the screen shifts colors, say from red to yellow, what platforms were yellow have now disappeared into the background, and what platforms were red, previously removed, appear to platform on. Initial levels bounce slowly between two colors while later challenges task you with running through obstacle courses that routinely shift between a multitude of colors at a rapid pace. This background color-changing mechanic not only forces you to be aware of where the visible platforms are, but it also forces you to be cognizant of when they will vanish and where new ones will appear. This multiplayer match of survival is just as hot and heated as the lava here! Despite its poor sales, the Wii U happily established itself as the local multiplayer machine when compared to the PlayStation 4 and Xbox One (though that isn't to say that those systems lack games for local couch play). 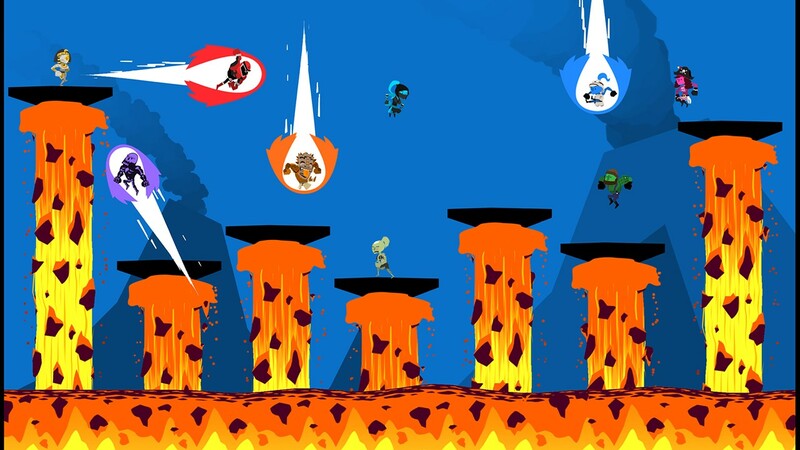 Runbow cheerfully leaps into the local multiplayer library of the Wii U, offering up to nine players locally with the use of Wii Remotes, Nunchuks, Wii Classic Controllers, the Wii U Pro Controller, and of course the Wii U GamePad. Local multiplayer's competitive offerings sport four unique modes. You get standard races where the goal is to foil your opponents with or without the aid of items to reach the level's goal, a trophy. You also have the wicked and wild king-of-the-hill style mode, which sees each opponent trying to stand on a level's platform for a specific amount of time (though this does not need to be done all in one mounting of the hill). Then, there is pure survival, where opponents attempt to slam others off the level into lava or some other type of hazard, and the player left standing is the victor. Finally--and this is the mode that unlike the other competitive multiplayer modes, cannot be played online-- is Defeat the Color Master, where the GamePad player does the background color-switching themselves, doing their best to foil his or her opponents run to the goal by tricking as well as tripping them up. Don't worry, you can very much become the queen of the hill too. Outside of those competitive modes, there is the opportunity to play cooperatively in the Adventure mode. You can also play this mode by oneself, which for some of the level designs, the mode works best this way. Regardless, whether alone or with a friend (three or more is usually a recipe for disaster-- though a fun disaster), Adventure mode comes complete with over 120 levels (including the DLC levels of Satura's Space Adventure) set across several grids. Since levels are usually less than a minute to complete, deaths aren't annoying despite putting you back at the start of your run. 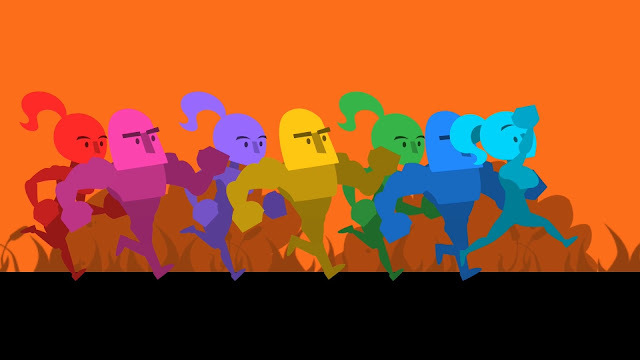 It's a rainbow stampede of colorful characters all vying for that prestigious trophy. The sense of progression in Adventure mode is nice and nonlinear, having adjacent levels on the grid open up next to the one just completed. If a particular level proves too much of a challenge currently, you can try a different level and path to the opposite corner of the grid's starting position. At this corner is a boss level, quite similar to most of the traditional levels only there's a boss to smack at the level's end. Other than running for the goal, there are two other level types, though rarer in appearance: one where you take out a set number of enemies, and one where you need to collect a certain number of trinkets. It's just fine and dandy to simply complete each level, but you also can earn up to three stars based on your completion time of each level. As rewards such as achievements and bonuses like concept art are unlocked through acquiring stars on levels, it's a good motivation to try your best and master the Adventure mode. Don't just complete Adventure mode levels-- race to the finish to score those wonderful three stars! Achievements and art aren't the only types of unlockables in Runbow: Deluxe Edition either. Performing certain tasks unlocks a host of indie and downloadable game all-stars, sort of like a Super Smash Bros. of indie characters. Whether it's Commander Video from the Bit.Trip series, Gunvolt from Inti Creates' Azure Striker Gunvolt, Freedom Planet's Lilac, Rusty from Image and Form's SteamWorld series, or an abundance of other characters who are purely visual in difference (possessing different animations as well as funny taunts to annoy your opponents), the amount of different characters both familiar and new to play as is really cool. This familiar cast of characters is just half of the indie faces available to unlock in Runbow: Deluxe Edition. The Adventure mode isn't the only single-player or cooperative mode available. Once you think you've become an expert at Runbow's massive amount of challenge, the game will prove your thinking wrong with the Bowhemoth mode. This mode has you running through increasingly more difficult chambers, one after the other without the ability to save. Making it to the finish is quite the challenge, and doing so with limited deaths or in a fast time (both things that aren't mandatory to do, but they are for unlocking certain content) are even more arduous of tasks. You're a near Runbow master if you can stay strong and persevere the Bowhemoth's challenges. 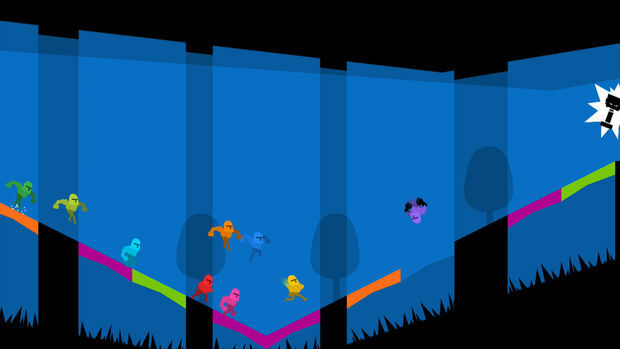 As stated, part of the fun of Runbow is how simple it is. That goes for the controls as well, which are as pick-up-and-play as any game I've recently played. There are but three actions in Runbow: moving, jumping, and punching. You can double jump and use your punch as a final boost either upward or to the side. Though the punch can see your cooperative buddies occasionally throwing shade at you for hitting them into a pit. However, this uppercut move is great for defensive reasons, such as getting extra height or rescuing yourself with a last second save. The only issue with the punch is that it's so easy to double tap the punch button that you might do a dashing punch when you don't want to and at an inopportune time. Keep an eye on the background in order to gauge which platforms will be safe to jump on and off of. 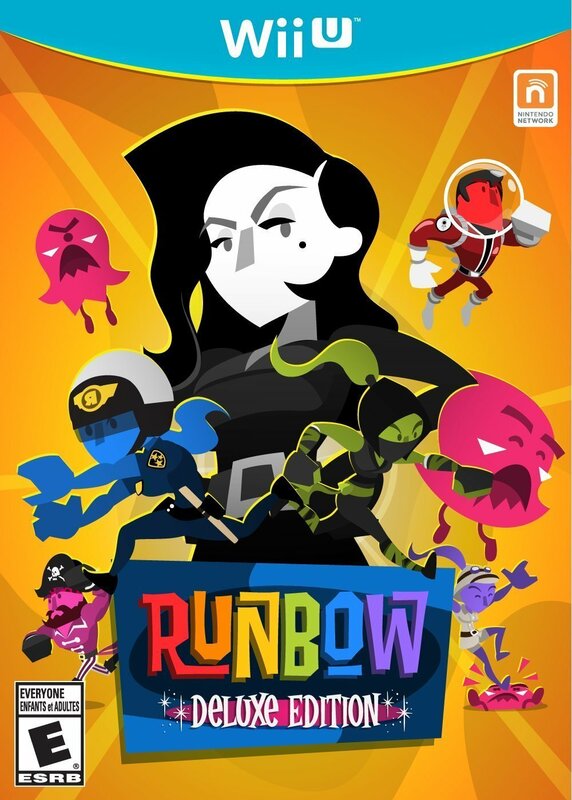 What separates the original version of Runbow and this Deluxe Edition? Well, obviously other than one being digital only and one being a physical disc with a voucher to digitally download the peppy salsa soundtrack, the Deluxe Edition has all the individual DLC packs included without multiple separate downloads. You're technically paying the same amount of money whether you get the digital version and all the separate DLC packs or the physical Deluxe Edition with everything included. The only big differences are freeing up some much-needed space on your Wii U's hard drive and the included voucher for the soundtrack. I've read that the original version of Runbow initially suffered from performance problems that greatly affected the frame-rate, something that would be seriously annoying for a precision and timing-based platforming game like this. However, and for at least the Deluxe Edition, these performance problems have been completely ironed out. No frame-rate issues of any kind were experienced through my 10+ hours with the game. The only concerning part of Runbow, regardless of which version you get, is that the online isn't too popular anymore. Definitely make sure you have friends or family members to play with. Runbow: Deluxe Edition takes everything players loved about the original Wii U exclusive and makes it available in physical form. For those who were new to the game like me, then you'll get a bevy of awesome content, crazy multiplayer, and a tremendous amount of laughter. While the Adventure and Bowhemoth modes won't last you too terribly long, Runbow: Deluxe Edition definitely deserves a space in your Wii U library, especially if you don't already own the original digital release.